The Maryland Historical Trust Library is the State's principal repository for information about Maryland's architectural, archeological, and cultural resources. Included in the archives is the documentation for the two components of the Maryland Inventory of Historic Properties: architectural properties and archeological sites. The library houses journals and approximately 5,000 books dealing primarily with archeology (terrestrial and maritime), Native Americans, architecture, history, historic preservation, decorative, building conservation and technology, and bibliography as they relate to Maryland and surrounding regions. The MHT oral history collection includes sound recordings and written transcripts of interviews. 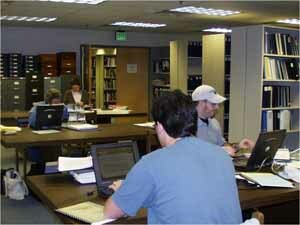 The library is open to the public on Tuesdays, Wednesdays, and Thursdays by appointment only. Researchers needing access to material related to archeological sites must read the following paragraph and be approved for an account before calling to make an appointment. For further information or to schedule an appointment, contact Lara Westwood by email at lara.westwood@maryland.gov, by phone at (410) 697-9546. All material relating to Maryland's archeological sites is accessible only to qualified researchers who have applied for, been approved, and received a password for a Medusa account. To request an account, go to https://mht.maryland.gov/secure/medusa/RequestUserAccount.aspx. The Maryland Historical Trust is proud to introduce Medusa, the State of Maryland's Cultural Resource Information System. Through Medusa, qualified resource professionals are able to access information about resources recorded in the Maryland Inventory of Historic Properties (MIHP) and the National Register of Historic Places (NRHP), as well as properties on which MHT holds preservation easements and information on resources that have been evaluated for National Register eligibility (Determinations of Eligibility, or DOEs). The system will allow access to archeological records to professional archeologists, agency representatives, and researchers working directly with professional archeologists. Documentation for the architectural and archeology sites which make up the Maryland Inventory of Historic Properties is maintained for approximately 43,000 architectural resources (individual sites and historic districts) and more than 13,000 archeological sites (prehistoric and historic). The architectural portion of the inventory is accessible to the public; however, archeological research files are restricted to use by qualified professionals. Architectural Survey Files typically include summary descriptions of the resource, a statement of significance, maps, photographs, negatives, and sometimes drawings. Survey files can include documentation about structures as varied as "houses" of all sizes and types (big houses, little houses, brick houses, frame houses, lighthouses, school houses, smoke houses, slave houses), towers (water towers, fire towers, bell towers), privies, barns, corn cribs, churches, railroads, bridges, milestones, industrial buildings, and a B-29 bomber. Archeological Survey Files currently include site-specific survey reports, maps, slides, and documentation for over 13,000 terrestrial and underwater archeological sites ranging from shipwrecks, wharves, piers, aircraft, historic domestic sites, cemeteries, slave quarters, mills, shell middens, and prehistoric villages and camps. Access to all archeological documentation is restricted to qualified researchers who have been approved by MHT archeological staff.